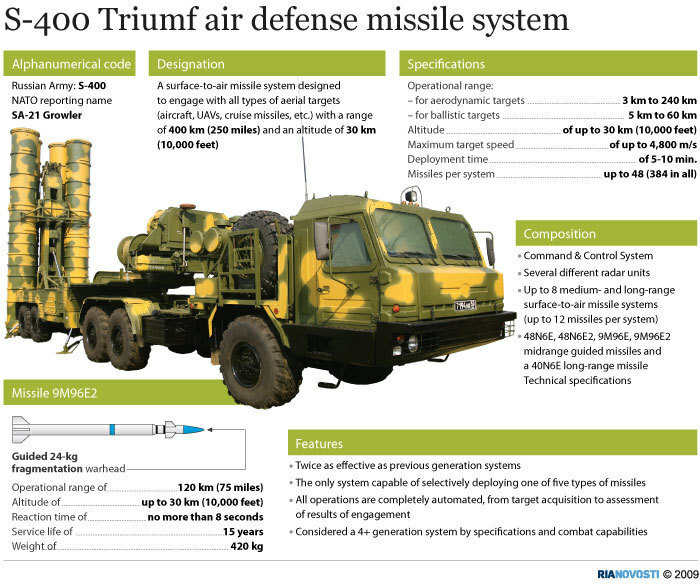 The S-400 Triumf (NATO reporting name: SA-21 Growler), previously known as S-300PMU-3, is an anti-aircraft weapon system. The S-400 uses three different missiles to cover its entire performance envelope. These are the extremely long range 40N6, long range 48N6 and medium range 9M96 missile. 91N6E – Maximum targeting range (detection radius is wider). –For a ballistic target (speed of 4800 m/s and a radar cross-section of 0.4 square metres): 230 km. –For a target with RCS of 4 square metres: 390 km. –For targeting of strategic – bomber sized types: 570 km. 96L6E radar and equipment work separately (100 metres), 96L6E2 export version has the capability to track a maximum 100 targets. In mountainous terrain the system is resistant to false returns or clutter. Replaces the radar to detect low-level radar targets and conduct radar sector review. Omnidirectional to detect all aircraft types, including low-observable, but not stealth (and not against ballistic missiles). 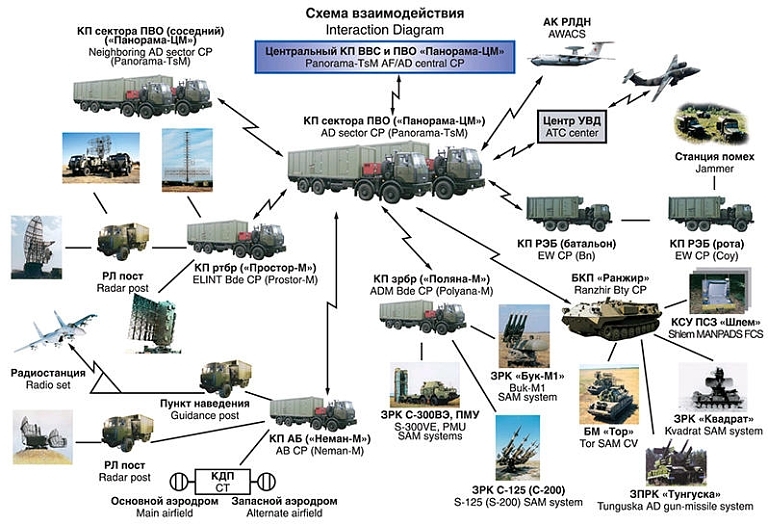 Can perform the functions of a command post for battalions of S-300 (SA20/20A/20B) or S-400. 96L6-1 of S-400 and S-500. Maximum height for the detection of the target 100 km away and from all directions. Can use a special tower 966AA14. Detection capability against cruise missiles and stealth. It serves as the command post for the battalions. Phased-array radar and multipath. Automatic operation, serves as the command centre for the entire system (all battalions and all external resources including passive). The maximum distance between the command center and the battalion of 98ZH6E with the use of retransmitters is up to 100 km. 5P85TE2 launchers and/or 5P85SE2 on the trailer in conjunction with a BAZ-64022 or MAZ-543M tractor-trailer. In 2014 a new type of transporter was introduced, improving the mobility of the system. The fuel consumption was cut by 35%. The total cost of launcher actually dropped 25% (The cost of transporters in 2014 is 8.7 million rubles (approximately 240 thousand dollars)). Just one system comprising up to 8 divisions (battalions) can control up to 72 launchers, with a maximum of 384 missiles (including missiles with a range of less than 250 km (160 mi)). The missiles are fired by a gas system from the launch tubes up to 30 metres into the air before the rocket motor ignites, which increases the maximum and decreases the minimum ranges. In April 2015 a successful test firing of the missile was conducted at an airborne target at a range of 400 km (250 mi). In other tests 9M96 missile using an active radar homing head has reached a height of 56 km . All the missiles are equipped with directed explosion warhead, which increases the probability of complete destruction of targets. In 2016, Russian anti-aircraft missile troops received new guided missiles for S-300 and S-400 defense systems. Antiaircraft missile system, designed to destroy aircraft, cruise and ballistic missiles, it can also be used against ground objectives. –The ABM capabilities of the S-400 system are near the maximum allowed under the (now void) Anti-Ballistic Missile Treaty. –The new anti-ballistic missiles 77N6-N and 77N6-N1 to enter service in 2014 supposedly add inert/kinetic anti-ballistic capability to the system. 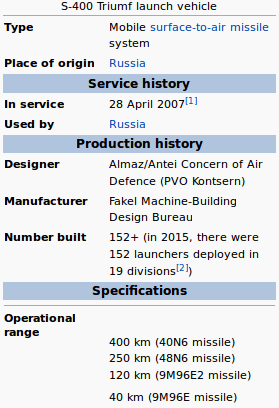 The same missiles will also be used by the S-500, which has a clearly stated anti-ICBM role. A separate independent air defence system 42S6 Morfey (Morpheus) is being developed. This system is designated as short-range air defense system to protect the S-400 from various threats at their terminal phases, and will also act together with the S-350E as a supplement to the SA-21 Growler. Together, these systems form part of the Aerospace Defence Forces. Development of Morfey started in 2007 and was planned to be introduced in 2013, however was delayed until at least 2015. The missile system consists of omnidirectional 29YA6 radar, infrared sensors and 36 missiles. The missiles have up to 10 km range and an altitude of up to 3500 m.
– All-purpose maximum radial velocity is 4.8 kilometres per second (17,000 km/h; 11,000 mph; Mach 14) (absolute limit 5 kilometres per second (18,000 km/h; 11,000 mph; Mach 15)), the minimum is zero. –System response time less than 10 seconds. –The complex can move on roads (60 km/h) and off road (ground) at speeds up to 25 km/h.